Today would be a good day for @realDonaldTrump to release is tax returns. @dchiasso @brianbeutler Fair point. But If you look at the Stone indictment, it does say that a senior campaign official was instructed to direct Stone to contact WikiLeaks. (Instructed by whom?) And though there are redactions in the report, you can see Trump apparently pushing to get info from Stone. At that time, Trump also said, “We could make deals in Russia very easily if we wanted to, I just don’t want to because I think that would be a conflict.” So he was secretly confessing in public to having engaged in a conflict? Trump supporters, how do you defend this? Mueller report reminder: In January 2017, Trump said, “I have no deals that could happen in Russia because we’ve stayed away.” A complete lie. See the whole section on the 2015-16 Trump Moscow project. Why did he lie? @brianbeutler No. The redaction is probably a reference to Stone. Mueller: Per DOJ policy, I do not have the authority to prosecute a sitting president. Barr: Per me, I have the authority to exonerate a sitting president. McFarland said yes. Trump said he doubted it was the Russians. He believed Putin over his own people. From the Mueller report: Two months after Manafort was booted from the Trump campaign, he sent Kushner a strategy memo proposing Trump depict Clinton “as the failed and corrupt champion of the establishment.” Corrupt, eh? RT @hardball: Tonight on #Hardball: The Mueller report's out and we're talking about it with @nytmike, @CynthiaAlksne, @LawProfButler, @TedDeutch, Jeremy Bash, @DavidCornDC, @JoaquinCastrotx, @Yamiche, @Eugene_Robinson, @SykesCharlie. Remember Trump saying he knows nothing about WikiLeaks? The Mueller report notes an incident [with redactions!] when it appears Stone called Trump, maybe in late summer 2016, and told him more damaging Clinton material was coming. Though there are redactions, it's clear throughout the report that theTrump campaign was in contact with Stone regarding WikiLeaks dumps. But Mueller "was unable to resolve" any Stone knowledge or link to the Podesta dump. 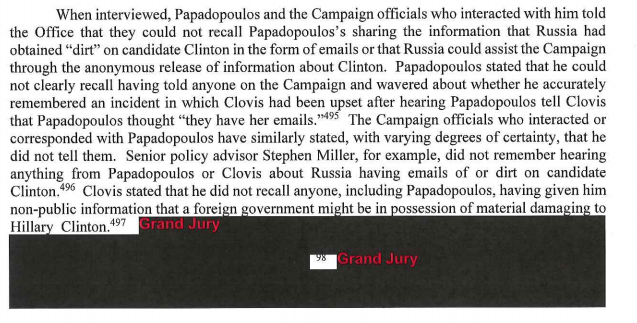 Hey rightwing conspiracy theorists who obsess about the Steele memos, Mueller's report confirms what we already knew: the FBI's Trump-Russia investigation began on July 31, 2016, in response to Downer's report about his conversation with Papadopoulos. Not started b/c of Steele. 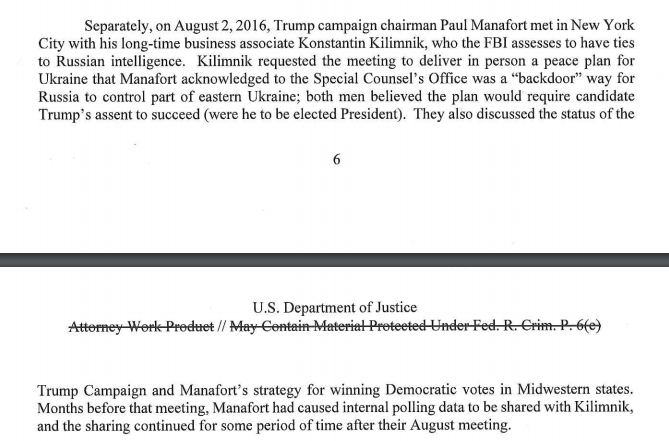 Hey rightwing conspiracy theorists who say Russia was not working for Trump and who embraced Barr's summation of Mueller's report, page four of the report notes that "by early 2016" Moscow's information warfare campaign--the IRA trolls—was working to help Trump. This was the opposite of Comey's press conference: I'm going to explain why the un-indicted target did nothing wrong. Didn't Richard Nixon sincerely believe that the Watergate investigation would undermine his agenda? "Fire that damn special counsel. And make sure to note in the memo that I'm really, really frustrated." Barr listen to what I say. You can read what this Mueller guy has to say later. RT @dfriedman33: New info from Barr so far include his implication that people associated with the Trump campaign may have tried to influence WikiLeaks' release of hacked material -- Barr says legally -- and that Mueller analyzed 10 instances of possible obstruction of justice by Trump. Barr: Russian government sought to interfere in our election process. Trump and his campaign aides: Russia is not interfering in the election process. Why were they saying this? Barr: No one associated with Trump "illegally participated in the dissemination" of hacked emails via WIkiLeaks. Note the word "illegally." RT @GrantLeeTweets: @DavidCornDC @chucktodd @realDonaldTrump Barr is thinking he can put a curve on the story through crafted wording. A kind of thinking that would have made sense pre-cable or pre-internet but it’s hard to imagine his “Nothing to see here” act working in this age, with the public engaged in self imposed jury duty.
.@chucktodd just said @realDonaldTrump and Barr have "successfully neutered" the impact of the Mueller report. That seems premature. We all should see what's in the report and what debate/discourse is subsequently necessary. The key question to ask Barr at this presser: will you make yourself available for questions at 3:00 pm today? Maybe today might not be the best day for @realDonaldTrump to release his tax returns. RT @igorvolsky: Woman who made Columbine threats: 1. Flew to CO 2. Went to gun shop in Littleton, CO 3. Passed instant background check 4. Bought shotgun & ammunition *** This is why we need to go *beyond* instant background checks. This is why we need firearm licensing + waiting period. 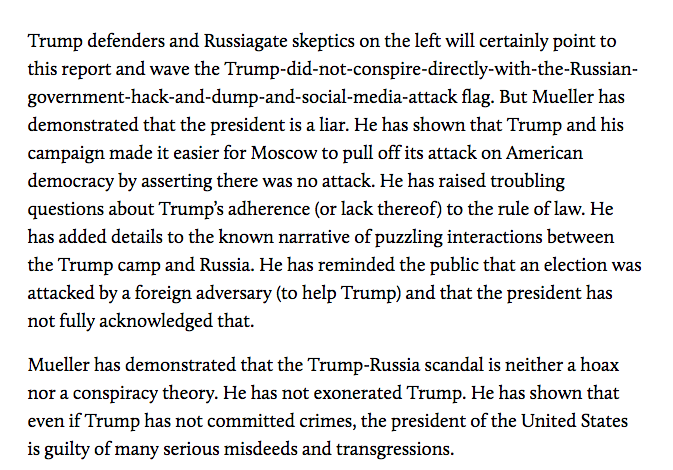 Memo to Everyone: As outrageous as Barr’s spin plot may be, focus on the heart of the matter: the Russian attack, how Trump & his gang aided & abetted the attack by denying it was happening, how Trump’s refusal to acknowledge the attack has put the US at risk, and obstruction.